2 How to Check Winners? 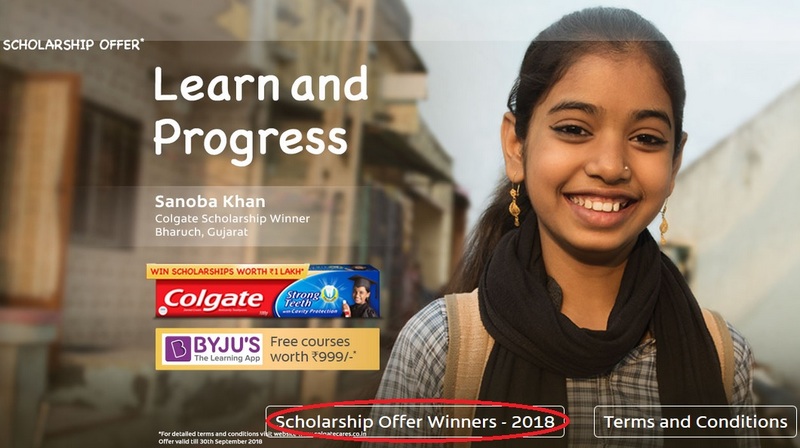 The name of the persons winning the Scholarship Offer will be published on www.colgate.co.in or www.colgatecares.co.in anytime between 1st June 2018 to 28th February 2019. 9 Ponnapula Leelanandhu Guntur A.P. 5 Akshay Dubasi Mancherial A.P. 15 Anshul Uikey M.P. M.P. 19 Arvind Srivastav U.P. U.P. 22 Chandani Manna Purba Medinipur W.B. 60 Md Sayyed Borabanda A.P. 63 Mohammad Fahad Agra U.P. 64 Mohammad Shakir Shahdul M.P. 65 Mukesh Kumar yadav Mirzapur U.P. 87 Pranshu Sen Satna M.P. 106 Sahil Dhuree Korba M.P. 110 Saraswati Pandit Purba Bardhaman W.B. 117 Soubik Ghosh Kolkata W.B. The Scholarship amount shall be paid by account payee cheque to the winner i.e. the parent / guardian of the child, if the child does not have a bank account or where the child has a valid bank account, cheque will be issued in the name of the child, which shall be posted to the winner on the confirmed address. ** The winners will be contacted on the numbers through which they have participated in order to collect their ID /proof & address for the purpose of making transfer of the prize either by cheque or funds draft. ** All winners would be sent a form on the address provided by the winners via telecom requiring particulars to be filled up in order to claim the scholarship prize. ** The participants contacted via telecom, can submit soft copy of required documents on Whatsapp number 9619172409 OR Email on colgatescholarship2018 [AT] groupm.com. ** Child’s birth certificate or school leaving certificate towards the proof of full name and age below 21 years is mandatory. ** The winners need to submit the aforesaid documents along with the duly filled in form within 2 weeks of receipt of the form from Colgate. The cost of postage would be borne by the Company.